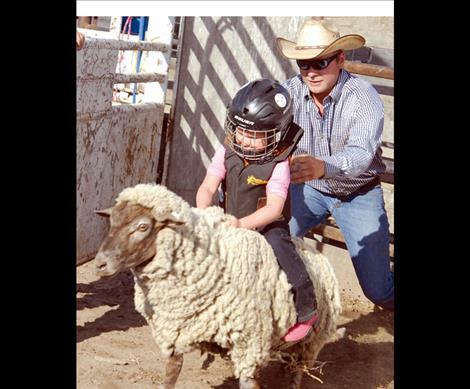 Brinley Jennison clings to the back of a sheep for a wild and wooly ride. POLSON — The 75th annual Mission Mountain NRA Rodeo on June 26 began with mutton bustin’ for the littlest cowgirls and cowboys. Three girls and seven boys marched across the arena at the Polson fairgrounds to do battle with sheep by such names as Sheeping Beauty, Shear Terror, Woolly Bully, Bewetiful, Baaaaad to the Bone, Asheep at the Wheel and Sheep Trick. 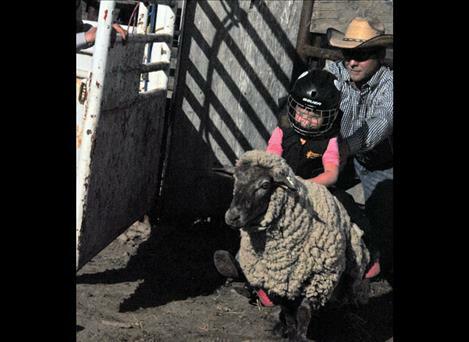 Riding a sheep is one thing when you’re just thinking about it, but when you walk out across that great big arena to the bucking chutes and there’s a big woolly sheep in there, it takes some guts — even if mom or dad is holding your hand. Most of the kids said they didn’t practice for the event, but Mikah Lamberson did. The 3-year-old sat on a kayak, and his grandmother made it buck and move back and forth. He also wore spurs for the event and held on for 71 points. “There are no losers in the mutton bustin’,” said Vance Ruff, rodeo announcer. Sure enough, every mutton buster got a popsicle.